All action movies need a big pointless shoot-out in a warehouse, and ‘Cop’ was no exception. This was one of the most challenging scenes to do as it required the co-operation of several extra’s over night at the college campus. An unfinished part of the building, known as ‘the void’, doubled as an excellent deserted warehouse for a gangland drugs deal. The set of the shoot-out resembled a drop in centre for students, with corners of the room being occupied by sleeping gang members, and a stupid fire fight taking place in the centre. Paulie Burgess, one of those such students, was left sleeping until 4:00 a.m. before we asked him to perform his violent death scene. We were at one stage concerned that he was going to leave as we had originally told him that the scene would take just a couple of hours. (This was standard procedure, if a scene was to take 8 hours, you’d say 3! If a scene was to take 3 days, you’d still say 3 hours!) Thankfully Paulie did come back and finish the scene, one which required him to roll around in agony on a floor covered in dust. He was surprisingly good at it. Filming was halted when that old enemy the sun came up and ruined our low light, forcing a second and even third days shooting on this one scene. How do you convince 6 people to turn up for a big dumb shoot-out scene at night when none of them really want to be there. Simple, find some of the saddest cases that you can, guy’s who really have nothing better to do. Guy’s like Jonathan Brett. Then to ensure loyalty, you tempt them with the wonderful catering provided by Eddie’s trip to the Spar, chockies and crisps. It had Mark Watts in a state of bliss. The shoot-out itself, as if again you hadn’t guessed, was pretty much made up on the spot depending on who got bored the quickest and wanted to go home the soonest. Naturally this was Dan Hopkins. He hates this kind of crap, can’t imagine what he was doing here in the first place. His ‘psycho’ stare was pure unadulterated boredom. His reluctance to be there was heightened considerably when he had to role around on the floor after being shot, then do it again because he was crap the first time… then keep doing it because he really was that bad. Mark Watts, naturally, stayed around the longest, while there were chockies and crisps on offer he was going nowhere. 3 days actually, and he even got some beer at the end of it, don’t let on but he was probably the highest paid actor in the film. I bet Jim Carey wishes he was in Watsy’s price bracket. Here are two production still shots from the shoot. The one on the left portrays one of the most spectacular stunts in the film. 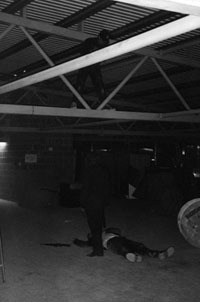 ‘Jake Cop’, played by Darren Jamieson, leaps from a beam on the ceiling of the warehouse, on to the ‘Knifeman’, played by Mark Watts. This stunt was performed three times, each time by the actors involved. And I have to say it bloody hurt! 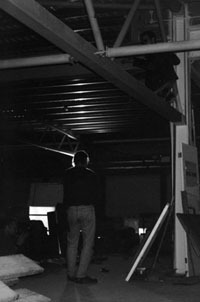 The still on the right shows Nick Murray standing on a ceiling beam in order to get a high overhead shot of ‘Sanchez’ killing his rival, ‘Lopez’.